In 1838, the year Queen Victoria came to the throne, London was bedevilled by a clawed, fire-breathing, shape-shifting demon popularly known as Spring-heeled Jack. A rather haphazard creation of local gossip, newspaper reports, and penny dreadful fiction, this urban legend, once largely forgotten, is now being revived through a contemporary interest in steampunk and reimagined Victoriana. The legend of Spring-heeled Jack originated with the frightening appearance of a ghostly white bull around Barnes Common in the autumn of 1837. As stories of what was initially called the “Suburban Ghost” migrated towards the capital from the villages that fringed south London, this mercurial character changed from a bull to a bear or imp, and then “an unearthly warrior clad in armour of polished brass, with spring shoes and large claw gloves.” (1) It was only in January 1838 that the metropolitan press, gathering snippets of gossip from across London, came to name him Spring-heeled Jack. Given individuality by his catchy name, Spring-heeled Jack transitioned from being just another local ghost scare to something more memorable and enduring, his name drawing together the many manifestations into one seemingly inhuman, shape-shifting figure. 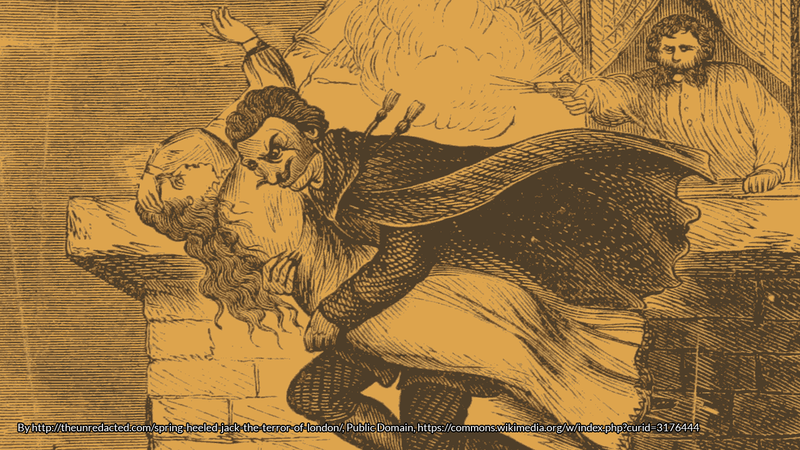 Spring-heeled Jack typically appeared at night, and his preferred victims were young women. What started as mere attempts to scare quickly escalated into more vicious assaults. In Isleworth he and several armoured companions set upon a carpenter and tore his clothes to shreds with their claws. The press suggested that his many different guises were the result of a group of ‘gentlemen’ engaged in a dastardly wager to frighten people into losing their wits. (2) Yet, when journalists tried tracking down victims or witnesses, they could not find anyone. Like many modern urban legends, these things were often said to have happened to a friend of a friend. The stories were given a degree of credibility when, in February 1838, an identifiable victim finally came forward. In what is one of the most detailed and often repeated accounts, 18-year-old Jane Alsop told the magistrates, how on the evening of 20th February, a cloaked man had appeared at the gate of her family home in Bearbinder Lane, near Bow. He had asked her to bring a light for the police had caught Spring-heeled Jack in the lane. She did so, but the moment she handed it to him he cast off his cloak, put the candle to his chest, and revealed to her “a most hideous and frightful appearance, and vomited forth a quantity of blue and white flame from his mouth, and his eyes resembled red balls of fire.” Alsop noted that “he wore a large helmet; and his dress, which appeared to fit him very tight, appeared to resemble white oil-skin.” (3) Spring-heeled Jack set upon her with what she believed were metal claws. She managed to get away from him but he pursued her to her front door, where he continued to rip at her clothes and skin, and tore hair from her head. She was eventually saved by her older sister who pulled her inside the house. 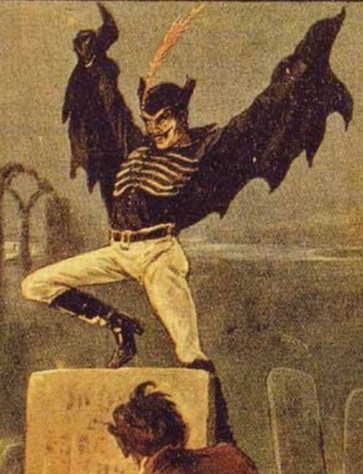 Spring-heeled Jack powerfully fused the medieval and the modern in being a fire-breathing demon who ran amok in the industrial cities of nineteenth-century England. We may have safely contained him by moving him from living folklore into steampunk fiction, but the recent “killer clown” scare has perhaps given us a taste of the unease our Victorian ancestors would have felt upon hearing about this strangely garbed and malevolent urban menace. Karl Bell and the lovely team over at Boydell and Brewer have offered a copy of The Legend of Spring-heeled Jack for a lucky #FolkloreThursday reader. WINNER of the 2013 Katharine Briggs Award, this book uses the nineteenth-century legend of Spring-Heeled Jack to analyse and challenge current notions of Victorian popular cultures. Starting as oral rumours, this supposedly supernatural entity moved from rural folklore to metropolitan press sensation, co-existing in literary and theatrical forms before finally degenerating into a nursery lore bogeyman to frighten children. 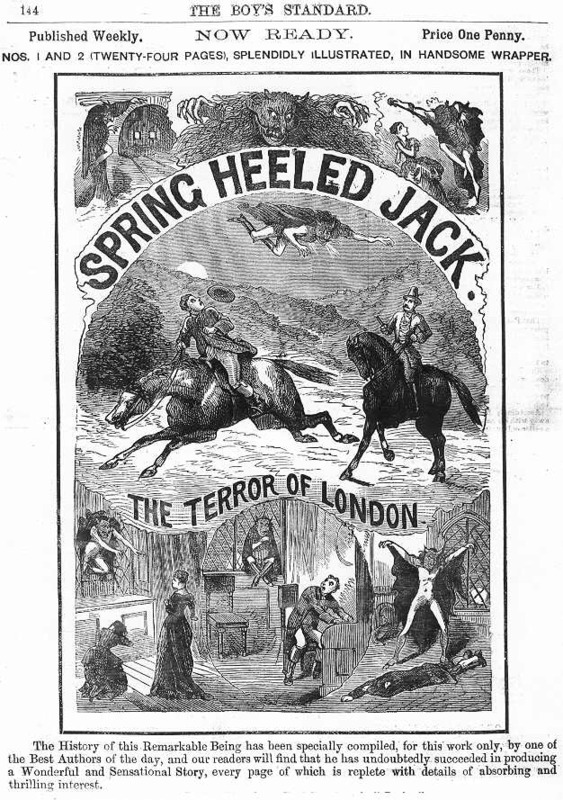 A mercurial and unfixed cultural phenomenon, Spring-Heeled Jack found purchase in both older folkloric traditions and emerging forms of entertainment. Through this intriguing study of a unique and unsettling figure, Karl Bell complicates our appreciation of the differences, interactions and similarities between various types of popular culture between 1837 and 1904. The book draws upon a rich variety of primary source material including folklorist accounts, street ballads, several series of “penny dreadful” stories (and illustrations), journals, magazines, newspapers, comics, court accounts, autobiographies and published reminiscences. The Legend of Spring-Heeled Jack is impressively researched social history and provides a fascinating insight into Victorian cultures. It will appeal to anyone with an interest in nineteenth-century English social and cultural history, folklore or literature. Sign up for the #FolkloreThursday newsletter to enter (valid February 2017). Morning Chronicle, 10th January 1838, and Morning Herald, 10th January 1838. Karl Bell, 2012, The Legend of Spring-heeled Jack: Victorian Urban Folklore and Popular Culture (Boydell and Brewer), p. 20. Morning Chronicle, 22nd February 1838. Morning Post, 7th March 1838, and Bell, The Legend of Spring-heeled Jack, p. 27-28. The Examiner, 4th March 1838. For a detailed examination of his appearance in Sheffield in 1873 see David Clarke, ‘Unmasking Spring-heeled Jack: A Case Study of a Nineteenth-Century Ghost Panic’ Contemporary Legend, no. 9 (2006), 28-52. Ipswich Journal, 21st December 1878. 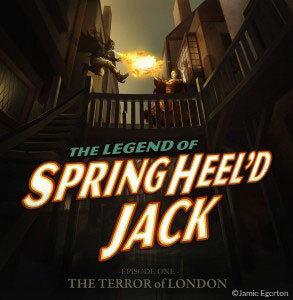 Anonymous, Spring-heeled Jack: The Terror of London (Dodo Press, 2008) or this website for an example of one of these penny dreadful stories. Distortions and inaccuracies in the 1904 ‘sighting’ have been carefully assessed in Mike Dash, ‘To Victorian Bugaboo from Suburban Ghost,’ Fortean Studies, vol. 3 (1996), pp.7 – 125. For a later ‘Spring-heeled Jack’ scare in Campbeltown, Scotland, see Daily Mirror, 6th December 1937. Jacqueline Simpson and Steve Roud, Dictionary of English Folklore (Oxford University Press, 2000), pp. 340-41. See, for example, Mark Hodder, The Strange Affair of Spring-Heeled Jack (Snowbooks, 2010). The Spring-heeled Jack Saga can be found here. For more on these recent incarnations see John Matthews’ book The Mystery of Spring-Heeled Jack: From Victorian Legend to Steampunk Hero (Destiny Books). 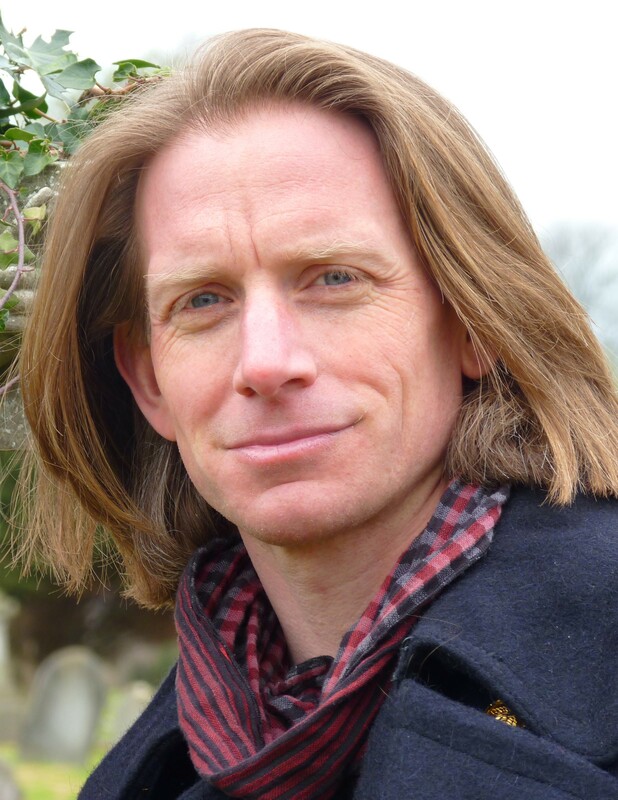 Dr Karl Bell is a Senior Lecturer in History at the University of Portsmouth and director of the Supernatural Cities project. His research interests include magic and the occult, supernatural folklore and gothic monsters. He is the author of The Magical Imagination: Magic and Modernity in Urban England, 1780-1914, and the award-winning The Legend of Spring-heeled Jack: Victorian Urban Folklore and Popular Culture. He is also co-editor of Dark City, a collection of ghost and horror tales set in Portsmouth. Follow him on Twitter on @imaginetheurban or @drkarlbell.